(Ver 1.2) Today is Part 4 of a series of very advanced lessons on Understanding Deception in the Bible. We have covered a lot of important information about this subject, so please do not start reading here in the middle of the series, go back and start reading with “Part 1” so that you can better understand what has already been covered in more detail than what I can do today. The church world has widely been taught that Satan is the initiator, instigator, mastermind, leader or distributer of deception in our world and that this deception is always evil. I of course concur with these facts whole heartedly. However, in the last lesson in this series I introduced you to the concept of “Righteous Deception” and I will carry this lesson further today so that you can better understand these new concepts revealed to us in the Bible. What I have discovered by Studying the Bible is that there are several types of deception mentioned in the Bible and some are positive and some are negative. By the Bible definition we can understand that evil deception is when someone comes to you with hurtful or harmful intentions and lies to you to get you to do something that you should not have done. However, I also showed you in the last lesson that the Bible speaks of “Self-Deception” as being a condition where a man or woman has deceived themselves into doing something that they should not have done. You should have gone and looked up the verses that I gave you so that you can better understand this situation so that it does not happen to you. So I gave you several brand new concepts about deception that you should at least be a little bit familiar with by now. According to God’s definitions, a deception in order for it to be a sin must be directed at a person to cause hurt or harm or an expected evil outcome. We clearly saw in Genesis 38 that Tamar used deception for a positive outcome and for the good of God, Judah and the nation of Israel. Tamar was exalted by God for what she did so that she was included in the genealogy of Jesus Christ in Matthew 1. Without Tamar’s intentional deception of Judah there would have been no King David, no Solomon and no Jesus. I know these statements rock your religious boats to no end. I totally warned you in these lessons that I was going to upset you evil deception apple cart so that you would have to see this subject in a new more complex and different way going forward and I hope that you are doing just that. In this verse it declares a concept that right “knowledge” is the key to doing what is best for you. What we learn is that if we would have known that the highway was closed, we would not have gone that way, for example. The Bible says in Hosea 4:6 that my people are destroyed for a lack of knowledge. So again knowledge is the key to not being destroyed in the world. Here in this verse, we have an instance of implied active righteous deception being taught to us. The princes of this world are references to Satan and his demonic angels. They are the rulers of this world that God is speaking of. If you look up the Greek word translated as “Prince” it means “ruler”. This verse then tells you that if they had known what was going to happen to them by killing God on a cross, they would not have done it. Do you understand this very complex concept being given? Satan hung Jesus on the cross because he didn’t know what was going to happen and he thought if he killed Jesus this would just get Him off of his planet. It appears to be a clear case of the lack of information from God and wrong assumptions on the part of Satan. This sounds exactly like what Abraham did in Genesis 12, doesn’t it? Abraham withheld information and the king made wrong assumptions and thus the wrong choice. It is very clear that God withheld important information from Satan and as a result Satan did the right things that God needed done. This is really an amazing example of God’s ability to control information in order to get a powerful spiritual being like Satan to do the right thing for God but the wrong thing for himself. You see it was God’s death on the cross that ended His covenant relationship with Satan and the angels forever. Satan is now only in covenant with the humans on the earth, the sons and daughters of Adam. I cover this in other blogs so I cannot repeat everything here. So just understand that the death of God on the cross caused something to happen to Satan that he greatly regrets today. Do you understand how God used deception because He had an evil enemy and how God is justified in using this deception because he was deceiving a deceiver. You can clearly see that this type of deception is a potentially powerful tool when used properly and not for evil. What I am trying to do is to get you to think outside the box and to see that not every deception in the Bible is an evil or a sin. This of course represents a two-edged sword in what I am trying to teach, because there will obviously be some who try to use what I say to justify their evil intentions and only God knows your heart better than you, so you will never get away with using this wrongfully. Gen 27:12 My father peradventure will feel me, and I shall seem to him as a deceiver; and I shall bring a curse upon me, and not a blessing. The mother’s plan was for Jacob to get his father’s blessing by the use of deception. You can clearly see that Jacob is concerned with being labeled a deceiver by his father, so we are definitely talking about a clear case of the act of deception in this story of Genesis. In this story you see that Jacob’s mother comes up with this plan of deception for her husband and two sons. I don’t know why this is the second story concerning the righteous act of deception by a woman. Rebekah tells her son Jacob to go and kill some animals that she can fix his father favorite meal. Then she tells Jacob to go and get some skins to cover his arms, hands and neck with. Why did Rebekah instigate this deception and for what purpose was it done? You might have to go back to chapter 25 to see part of the answer to this question. When the children were still in the womb of Rebekah, she noticed that they were already fighting inside of her. She went to God to find out why and God spoke to her some inside information (literal pun) that was very relevant to this lesson of deception. God says these are two nations of people and only one will be called by my name. Not good news for one of them, is it? Here we have a story that is very difficult to grasp and accept. Esau is clearly a child of Isaac and the firstborn from him, the rightful heir of all of his father’s wealth. But, God said that the elder firstborn would serve the younger second born. You should understand the concept of “Analogies” from the Bible if you have read my other Bible lessons. This is a concept that a natural real story gives us spiritual information about two spiritual brothers that I just cannot get into today. Just understand that there is more information hidden in this story than is on the surface and then go and dig for it. I will help you and tell you that the younger son is a type of Jesus so now go and figure out who is Jesus’ older brother. So God knew the sons of Rebekah before they were born and God also knew what they would do in this world before they were born. So God let Rebekah in on a secret and this was why she could do what she did and be justified in the eyes of God. So why was Jacob justified in doing what he did in deceiving his father for the blessing? So then Jacob tells his brother to swear that the birthright will be his. 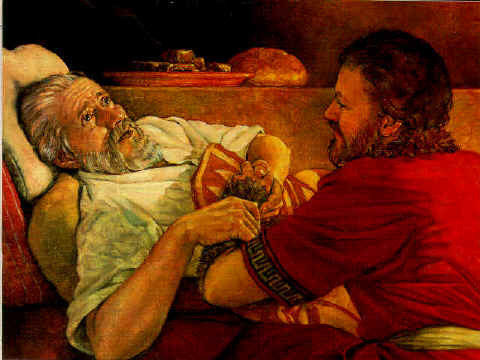 So you can clearly see that Esau sold his birthright to his brother for a bowl of soup and some bread. Esau also gave his word to his brother and in the eyes of God your word is your legal commitment to do what you have said. If you did not mean it you should not have said it, the Bible says. It could be that Esau was playing Jacob for a fool because he clearly still expects to go and inherit the blessing from his father later in this book of Genesis. You can see that God says the man Esau “despised” his own birthright. This Hebrew words means to NOT Esteem or to disdain, scorn. It is the act of a vile person the definition says. This is certainly not a positive confirmation for what Esau has done in the eyes of God. It also gives legal justification for what Rebekah and Jacob did to deceive Isaac for the blessing that now rightfully belonged to Jacob. There is a lot of things to learn from this story, and one thing is that even though Jacob was justified in what he did, the Bible says that God is not mocked whatsoever a man sows that will he also reap. So Jacob planted the seeds of deception and these came up when he was working for Laban for his wife Rachel. Laban deceived Jacob 10 times it says in the Bible changing the terms and conditions of his employment. Jacob thought he was working for 7 years for Rachel and ended up working 14 years for her. So while you can be justified in doing deception, it usually always comes back to bite you later in life. God however, did not abandon his man Jacob and continued to bless him even though Laban was attempting to steal from him and to use him. So it is interesting to note that Esau was legally the heir of his father Isaac, but God caused this blessing to go to his younger brother Jacob who became the father of the nation of Israel. So we learn that not everyone that came from Abraham can be called Israel, only Jacob’s descendants. This is an example of righteous division or separation. The sons of Esau were not the chosen ones. What we have seen is a clear use of deception initiated by God. God told Rebekah about the sons in her womb before they were born. I do not know if you like everything that the Bible says or not. Many of these types of stories are very difficult for many to accept. I sure if you wanted to you could come up with alternative meanings and interpretations to everything that I just have taught on this subject of deception. But, I hope that you can see who God was dealing with and why deception was used to cause a positive designed result. I think that I will end this lesson here today. God Bless! If you would like to continue reading in this series about deception, please go to “Part 5“. Posted on November 12, 2010, in Advanced Topics, Bible Study, Understanding and tagged Bible, Christianity, Church, deception, Genesis, God, Holy Spirit, Jesus, Prophecy, Religion, Revelation, Satan, Symbolism, Truth, understanding. Bookmark the permalink. 2 Comments. Thank you so very much for this insightful study on deception. I concur with all your conclusions given from the examples provided. I would be happy if you could approach the topic from the viewpoint of the “deceived” or “victim” of deception sometime in the future. Thanks again for this much-needed study! Thanks for you comment and the suggestion. God Bless!